CENTENNIAL (5-0 overall, 0-0 Big VIII League) had a pretty average preseason, averaging nearly 40 points per game through four games and until running up 77 points against MoVal Valley View in Week 4. Now begins. Now the Huskies are averaging more than 45 points per game heading into league play and looking at another unbeaten regular season. Senior RB Thomas Kinslow ran for 127 yards and two TDs on 10 carries in the win, his first 100-plus rushing performance this season. 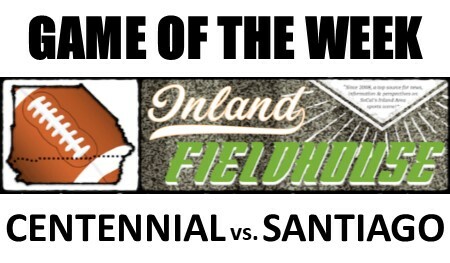 SANTIAGO (3-2 overall, 0-0 Big VIII League) got back on the winning side of things the last two weeks with back-to-back victories over Grand Terrace and Etiwanda, respectively. The wins have salvaged the early part of the season for the Sharks, which looked dangerously close to going sour after losses in Weeks 2 and 3. RB Vincent Pacleb got the only touchdown in a 7-0 victory over Etiwanda last week, a big statement for a player who has already missed time this season with a shoulder injury and a concussion. Senior QB Nate Castillo played his first game without throwing an interception in the win. Talent level, same as it’s been the last 15 years.